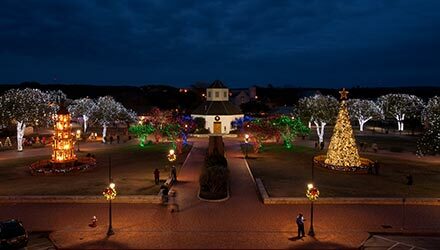 Fredericksburg Christmas lights and décor are up through Sunday, January 6. Fredericksburg turns merry into magical! SEE OUR FULL HOLIDAY CALENDAR! Two months of shopping and seasonal events! Christmastime in Fredericksburg is like stepping into a holiday wonderland! Imagine over 150 shops overflowing with “that perfect gift.” From home décor to handcrafted art, and from the latest fashions to antique finds, you’ll discover something for everyone on your list, including yourself. Stroll leisurely, step into one of the many wine tasting shops, or take a break at one of the restaurants —all amidst a backdrop of historic Main Street, completely decked out for the holidays, twinkling lights and all. With a full calendar of festive events and activities during November and December, a visit will definitely be on your wish list! OFFICIAL HOLIDAY EVENT GUIDE — DOWNLOAD NOW! Yes, that’s right. 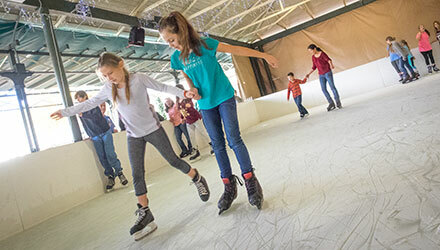 From the day after Thanksgiving through the New Year, the whole family can enjoy a nostalgic spin on real Texas ice. Take a break from shopping and go rent some skates, visit the snack bar, or simply watch from the sideline tables. It’s right in the center of town under one of our Marktplatz pavilions. Check the calendar for exact hours and make your plans now. If live theater and music is your style, then take your pick! Both Fredericksburg Theater Company and Rockbox Theater have a host of performances scheduled throughout November and December. 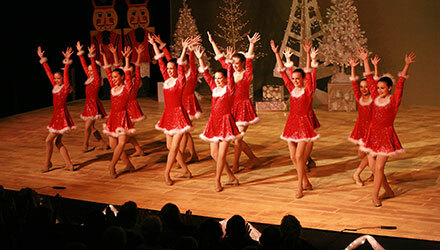 From country Christmas classics and Elvis, to the Beach Boys and the musical theater of Winter Wonderettes, there is no shortage of musical entertainment during the holiday season. It’s called “Victory Cup” and it’s the hottest new event in Fredericksburg! Take your pick of eclectic endeavors — or enjoy it all! 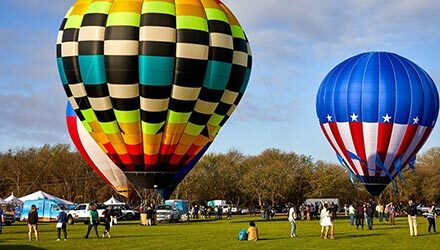 In addition to food and beverage tastings, live music, and a variety of vendors, the weekend is filled with unforgettable adventure including balloon glows, polo matches, tethered hot air balloon rides, an enormous farm-to-table dinner and so much more. Advance tickets only – no day of event ticket sales at the gate. 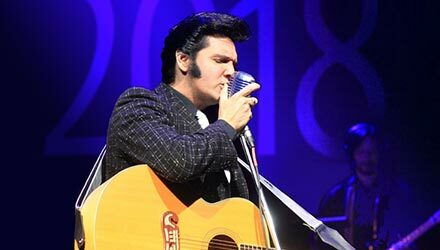 Toast 2018 by going back to 1976 with Donny Edward’s Tribute to Elvis. This show crosses all generations and will be a great way to spend some of your holiday season. This impressive tribute to Elvis honors the man and his music with attention to detail and a voice that exceeds expectations! Friday at 8 pm; Saturday at 4 pm. Discounted tickets for kids are available by calling the box office. Secure seats now! 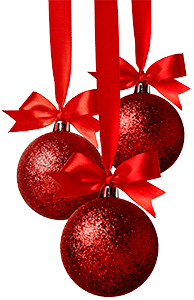 Dance in the New Year on Monday, December 31! 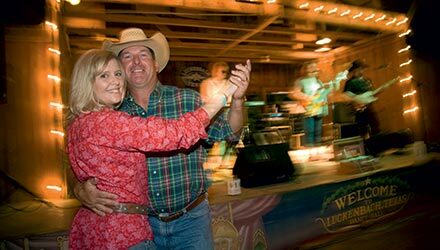 The New Year’s Eve Dance in Luckenbach Texas will have you boot-scootin’ to the music of the Almost Patsy Cline Band. Or check out the Turner Club New Year’s Eve Dance, with live music by The Wagon Aces – at the Gillespie County Fairgrounds. Either way, you’ll be welcoming 2019 with a big ol’ Texas Hello! Get more info. Ten. Nine. Eight. Seven….. join us for the Countdown to 2019 at Marktplatz on Monday, December 31. Bring the whole family at 4:00 for a of couple hours of family-friendly events. In fact, there’s even a ball drop at 6pm for the little ones who just won’t make it until midnight. All ages are also welcome from 10:30 p.m. to 12:30a.m. when things really start rockin’—leading up to the official ball drop at midnight. See you there!